We’re not done sharing Comic-Con Arrow interviews yet… and there’s even one more to come after this one. Today, the spotlight falls on John Barrowman, who is so excited that Malcolm is the new Ra’s al Ghul that he has his own Demon’s Head ring. And, hopefully, doing the interview isn’t as torturous as it was to be on Ra’s bad side last season (see above). 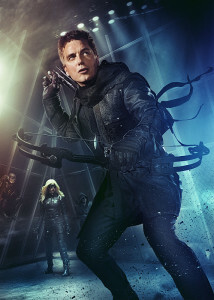 Among other things, we tried to find out if Malcolm has anything to do with Sara Lance’s resurrection next year. And, of course, he wouldn’t tell us much.